How to get to the Sacred Valley of the Incas? The Sacred Valley of the Incas is quite extensive, covers more than 100 kilometers in length and goes from west to north in the territory of Cusco. There are two direct routes that connect Cusco with the Sacred Valley and connect the towns of Pisac, Urubamba and Ollantaytambo. The airport Alejandro Velazco Astete in Cusco is the closest to the Sacred Valley. To reach the Sacred Valley of the Incas, you must first arrive in Cusco; Usually your visit will begin in the town of Pisac and continue through the city of Urubamba and then you will visit the beautiful town of Ollantaytambo; From here it is possible to take the train to Machu Picchu; But you will not be able to enter the Inca city without reserving the tickets Machu Picchu in advance. Buses depart every day from Cusco to all the cities of the Sacred Valley; You will find buses that depart every 15 minutes towards Ollantaytambo. Bus tickets cost around S/. 15 soles. And they are the cheapest way to travel the valley; However, an organized tour will save you the time you spend making transportation connections; In addition, travel safer. Getting to Pisac by bus will take you from 45 minutes to an hour and costs approximately S/. 7 After reaching Pisac, you can walk 5 minutes to the market or visit the ruins of Pisac, at the top of the city. From Pisac, you can pass to Urubamba in 30 minutes, or to Ollantaytambo in an hour; Prices vary between 5 and 10 soles. You can also arrive directly from Cusco to Urubamba. The trip takes about an hour and a half and costs S/. 6 From Urubamba you can visit the villages of Maras, Moray and Yucay, all are located a few minutes from this city; Then you can continue to Ollantaytambo (30 minutes). Be sure to bring plenty of change to pay for the buses through the Sacred Valley. Buses to visit the Sacred Valley can be taken at “Pavitos Street” or “Puputi Street” in Cusco. Collectives are a popular and profitable way to get to the Sacred Valley. Small cars or minivans leave Cusco once they are full; This service can cost between 15 and 20 soles per person; You can find the buses at various points in the city of Cusco, in Pavitos Street, in the main square of Ollantaytambo (on the way back), and on the way to Cusco – Pisac. Taxis are the fastest and most convenient way to get to the Sacred Valley; Cost between S/. 60 and 120 soles depending on where you want to go. Taxis are usually speeding along the highways of the valley, if you think your driver is taking unnecessary risks, do not be afraid to tell him to slow down. Joining a group on a pre-organized tour is the most popular way to tour the Sacred Valley of the Incas. In addition to acquiring the Machu Picchu Tickets for you, we can arrange all your itinerary and transportation around the Sacred Valley. This guarantees you qualified guides, reliable drivers and more comfort. It also means that you will not waste “valuable” time making the transport connections yourself. In most cases an organized tour begins in Cusco, with stops in Pisac, its market, Urubamba, Ollantaytambo and the town of Chincheros back to Cusco. One of the best options for people traveling to Machu Picchu is to spend the night in Ollantaytambo and continue to Machu Picchu on the first train in the morning, instead of returning to Cusco. Exploring the sacred valley on a private tour gives you more flexibility in scheduling and itinerary of your route. You will be able to decide on which places you want to spend more time, like the Pisac market or somewhere that will draw your attention to others. For more information contact us at info@boletomachupicchu.com. Will I need a ticket to the Sacred Valley? 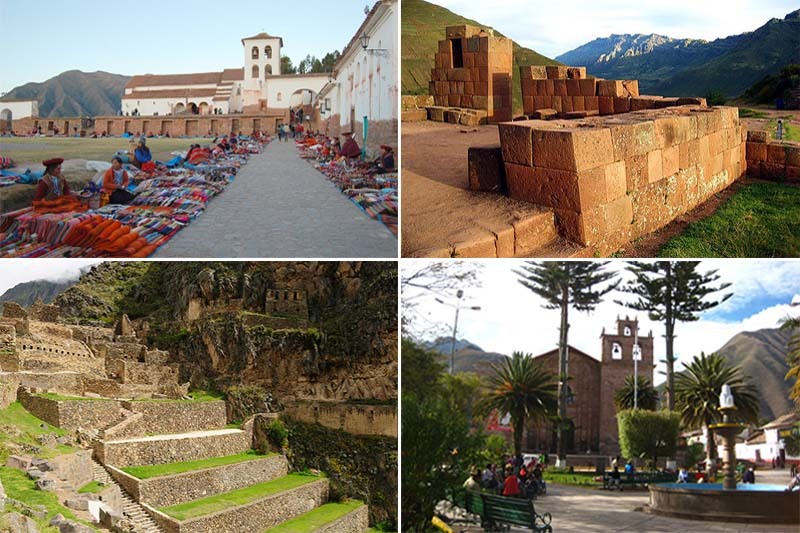 The Tourist Ticket of Cusco will allow you to enter 16 sites, including Pisac, Chinchero, Ollantaytambo, and 13 other archaeological sites and museums in Cusco and the Sacred Valley; Although you can also buy “partial tickets”. You can buy them in the offices of the Tourist Ticket of Cusco, in the square of arms of Cusco or in the Av. El Sol, in the historical center of Cusco. The ticket includes the income to the archaeological sites, but not their transfer to them.